Arizona Gov. Doug Ducey met dozens of Valley elementary school students Wednesday in Grand Canyon University Arena and helped some of them shop for school clothes, leading them through various “departments” around the Arena floor. 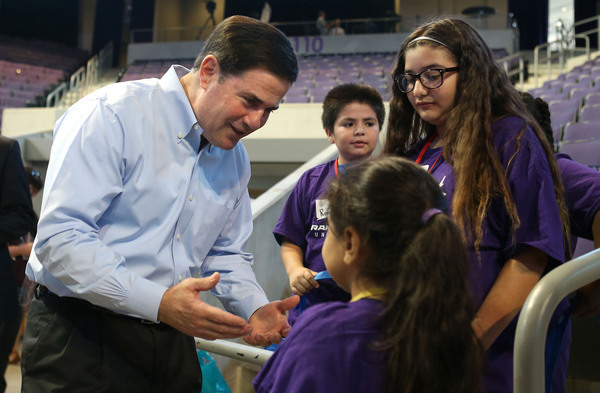 Ducey was among 3,000 volunteers who pitched in this week on the nonprofit Back to School Clothing Drive’s “New Clothes, New Beginnings” summer distribution event. He assisted a 7-year-old girl with her school shopping and rubbed shoulders with other children whose faces seemed to light up at picking out their free new duds. Arizona Gov. 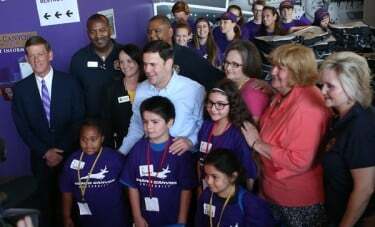 Doug Ducey visits with Valley elementary students at GCU Arena during the 21st annual Back to School Clothing Drive “New Clothes, New Beginnings” event. The four-day event, which began Monday, is expected to outfit more than 5,500 children from 140 schools in 40 Valley districts with new clothes and classroom supplies that their families otherwise may not be able to afford. Each child is receiving clothes, shoes, backpacks and supplies valued at $300. The effort aims to restore the confidence and academic focus of students in families struggling through tough economic times. Back to School Clothing Drive anticipates that more than $2 million in clothing and school supplies will go to underprivileged children by the end of the event, which GCU is hosting for the third year. Ducey told members of the media that, as Arizona lawmakers consider the governor’s new $2 billion K-12 education plan, events such as Back to School Clothing Drive help build the confidence of children as they prepare for the coming school year. The Arena floor is set up like a massive store where volunteers from dozens of local schools, companies and organizations are helping children select items that suit them. On Monday, Phoenix Mayor Greg Stanton helped a 5-year-old boy choose his clothes and school supplies. Among other program sponsors are the city of Phoenix, Bank of America and KPHO-TV. For many of the youngsters, the trip to GCU was their first visit to a college campus. Ducey poses with GCU President/CEO Brian Mueller (far left) and others who made the four-day event a success. Karl Gentles, executive director of Back to School Clothing Drive, said GCU is an ideal host because it offers a natural setting for children to see what college is like. It may help them envision the pay-off of their hard work in grade, middle school and high school. In addition to its work with the clothing drive, GCU’s support for K-12 academics is reflected in its free afterschool Learning Lounge, tuition-free STEM Scholars program and employee-driven Canyon Donation to Education. “The University has been really great about opening its doors to Back to School Clothing Drive,” said Dr. Jim Rice, a drive board member, GCU Hall of Famer and superintendent of Union Elementary School District #62 in Phoenix. “This event does so much to expose these kids to the look and feel of a university campus,” he said.